Concrete can make for a smooth, low-maintenance flooring material, but not everyone likes the look of dull, gray concrete. With a little paint and some homemade painting stamps, you can create the decorative illusion of a stylish tiling job at a fraction of the cost of installing real tile. At the same time, you retain the functional benefits of the durable concrete surface. Wash the concrete floor thoroughly with a soap-and-water solution to remove all dirt and oils. Alternatively, wash the floor with trisodium phosphate (TSP), following the manufacturer's directions. Rinse the floor thoroughly with clean water. Let floor dry overnight, then tape off baseboards or other trim, as needed, with painter's tape. 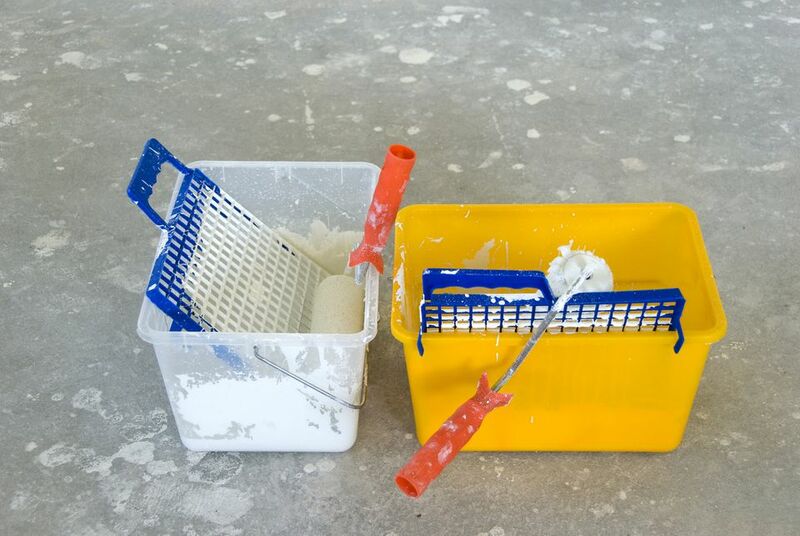 Apply gray enamel paint to the entire floor, using a roller. This will be the canvas on which you will make your tiles. As you work, be careful, not to paint yourself into a corner. Apply a second coat, if necessary, to ensure consistent coverage and color. Allow the paint to dry overnight, or as directed by the manufacturer. Determine how big you would like your tiles to be. Standard sizes are 12 by 12 inches or 16 by 16 inches, but you can choose any size you like since you will be making them yourself. However, don't make them larger than an 18 by 18 inches because they can become difficult to stamp. You can make all of the tiles the same size or use or combination of tile sizes. Also decide how wide your grout joints between the tiles will be. 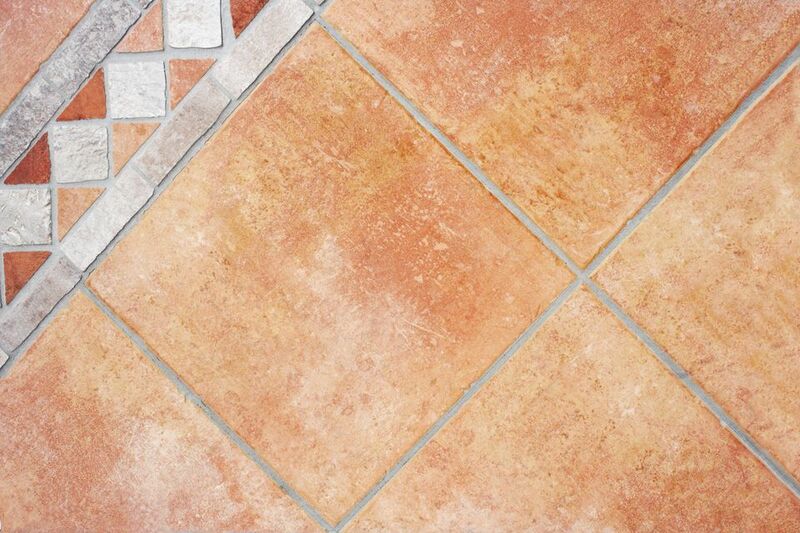 Grout joints for real terra cotta floor tiles often are 1/4 inch to 1/2 inch wide, but yours can be any size you like. Measure and mark the center of each wall of the room, then use the marks to snap two perpendicular chalk lines that intersect at the center of the floor. Using your tile and grout dimensions, step off the tile layout, starting at the floor's center, to make sure the tiles will fit the space with a pleasing pattern. If you end up with very narrow tiles along any of the walls, you can snap new chalk lines to change the layout. Draw the shape of each size of tile onto a piece of foam rubber, using a ruler and pencil. Cut out the shape from the foam with a utility knife and T-square. Place the foam pieces onto a flat cardboard sheet, and trace around them with a pencil, then cut along the traced lines. Glue each cardboard piece to the back of each matching foam piece, using contact spray adhesive. The cardboard serves as a backing for the foam stamps. Select two to four paint colors to create custom coloring for your tiles. The most common options for terra cotta are burnt orange and earthy browns, contrasted by bright blues or reds. Pour each paint color into a separate squeeze bottle so that you can create veined swirls that will mimic natural features. Squirt the different colors onto a piece of cardboard, covering an area slightly larger than a single tile. Wearing rubber gloves, gently swirl the paint with your fingers so the colors mix but do not completely blend into one color. Dab one of the foam stamps (using a primary size) lightly into the paint so the foam surface is completely covered with color. Wipe off excess paint from the sides of the stamp, using a cloth or newspaper. Starting at the center of you chalk-line layout, press the tile down onto the floor firmly, then remove it by pulling straight up, creating a clean tile shape that is bordered by the chalk lines. Repeat the stamping process, placing the tiles in straight lines, and spacing each tile according to your desired grout joint width; anywhere you don't stamp will look like a grout joint. A single dip in the paint should allow you to stamp several tiles before you have to reload the stamp with paint. If any of the tiles look blotchy, you can hit them a second or third time as needed. Use a clean rag to wipe up any excess paint that drips or smears outside of the tile edges. Let the paint cure fully, as directed by the manufacturer. Apply a quality polyurethane (make sure it is compatible with your paint) to create a protective finish over the entire floor. Polyurethane can be applied with a standard paintbrush, a foam brush, or a painting pad. Apply two or three coats, following the manufacturer's directions for application, preparation between coats (as applicable), and drying times.